We have come up with Gobble Chocolate which has creamed wafers completely coated and wrapped in rich delicious chocolate. 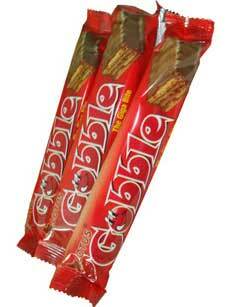 The big size makes sure that the joy of eating Gobble Chocolate lasts for a long time. Further, the chocolate in Gobble does not harden or melt based on temperatures, because of the special technique it is made with.